When you think of modern Khaleeji architecture, skyscrapers immediately come to mind. There is definitely an abundance in those here, each one with more interesting architecture than the other. Let us take a look at some of the tallest skyscrapers in the GCC. 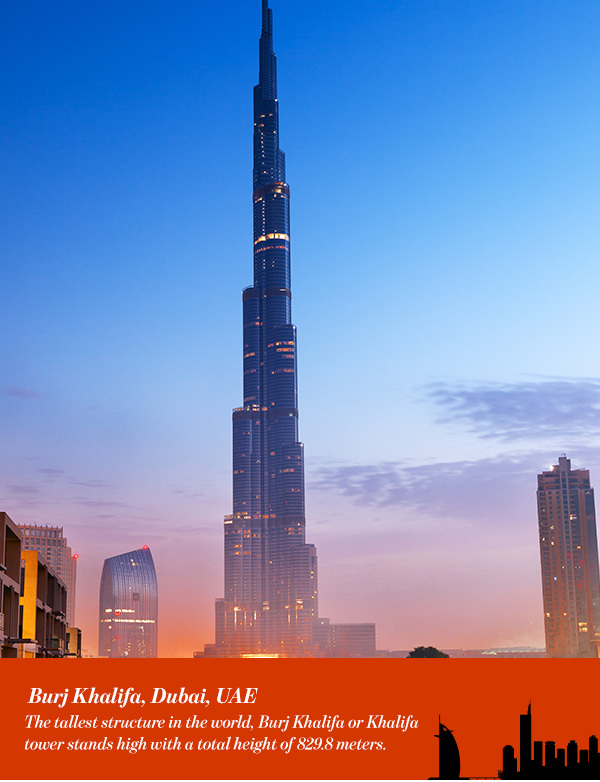 The tallest structure in the world, Burj Khalifa or Khalifa tower stands high with a total height of 829.8 meters. Construction of the impressively tall tower began in 2004, and the building was opened in 2010. The building was named in honor of the ruler of Abu Dhabi and president of the United Arab Emirates, Khalifa Bin Zayed Al Nahyan. Burj Khalifa was designed by the architect Adrian Smith, whose company designed several famous towers such as the Willis Tower. The design of Burj Kkhalifa is influenced by the Islamic architecture of the region. There are two observation decks in the tower, one in the 124th floor named At The Top, it stand at 452 meters. The second one named Sky is in the 148th floor at 555 meters. Among several other rewards, Burj Khalifa won the award for best project of the year at the Middle East Architect Awards 2010. Translated as “The Towers of the House”, Abraj Al Bait is a complex of seven skyscraper hotels in Mecca. 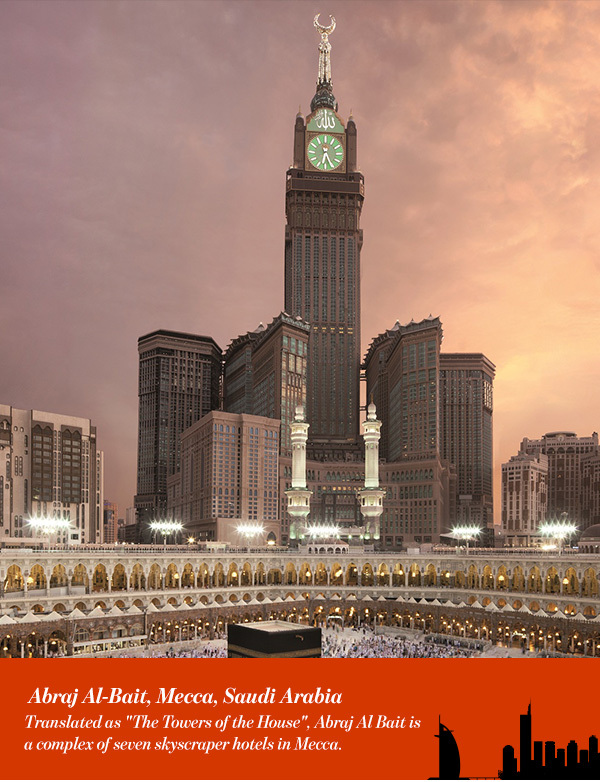 The central tower, Makkah Royal Clock Tower, which is a Fairmont Hotel, has got the world’s largest clock face. It is also the tallest building in Saudi Arabia, with a height of 581.1 meters, and is the third tallest building and fourth tallest freestanding structure in the world. The hotels are designed to accommodate the millions of worshippers who fly to Mecca from all over the world. In addition to the hotels, the Abraj Al-Bait Towers has a five-story shopping mall, a huge mosque or prayer room capable of holding more than 10,000 people. The skyscrapers were built by Binladin Group, Saudi Arabia’s largest construction company. And the tallest skyscraper in the complex was designed by the German architect Mahmoud Bodo Rasch. Located in the Marina district in Dubai, the Princess tower is the tallest residential building in the GCC. The skyscraper stands at 107 stories and includes basement floors, a ground floor and 100 levels above ground. 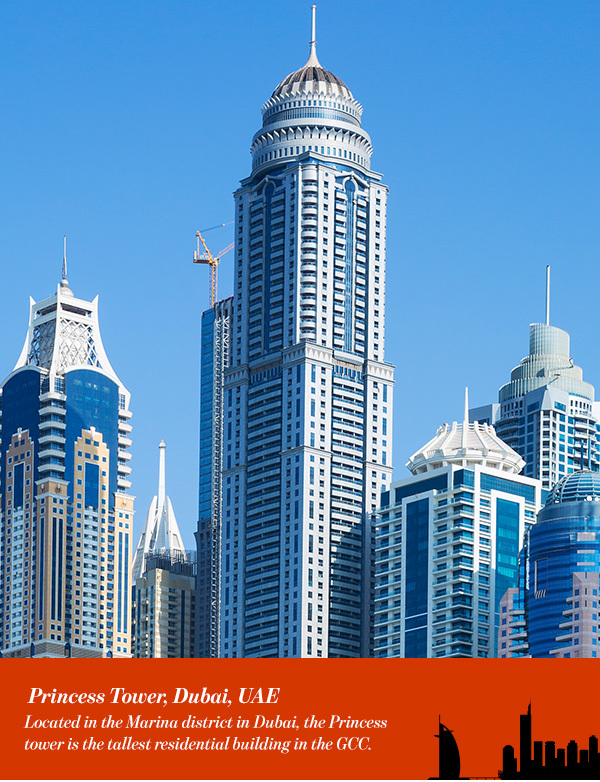 With a marvelous view over the Dubai Marina skyline, the building stands tall at 414 meters from base to tip. With an impressive height of 414 meters, Al Hamra is the tallest building in Kuwait and the tallest carved concrete skyscraper in the World. The architecture of the building, which is a work of beauty, was Designed by architectural firms Skidmore, Owings, Merrill and Ramshir. 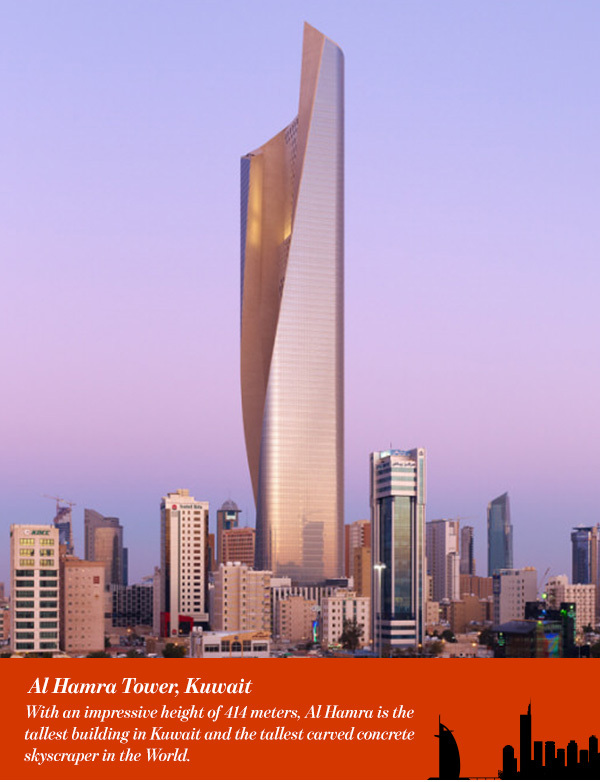 The unique design of the tower creates the illusion of a subtle twist, it was created in order to maximize views of the Arabian gulf and minimize solar heat. The sculptural skyscraper contains a complex of offices, a health club, and a high-end shopping mall. 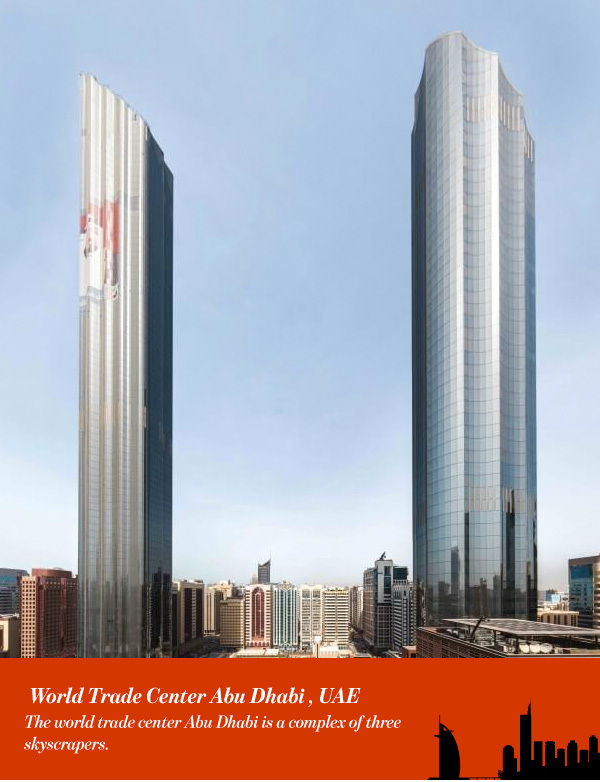 Moreover, Al Hamra tower was named one of the best inventions of 2011 by TIME magazine. The world trade center Abu Dhabi is a complex of three skyscrapers. The residential building, Burj Mohammed bin Rashid, stands 382 meters tall and contains 92 floors. It is the tallest building in Abu Dhabi and the skyscraper with the most floors in the city. The adjacent office tower, the Trust Tower, rises 278 meters and has 60 floors. It houses offices and lease properties and is connected to the third tower by a shopping mall. The Central Market Hotel Tower is the shortest building in the complex, it stands 65 meters tall and houses 16 floors of hotel space. It is currently run by Marriott hotel. With a height of 260 meters and 53 floors, the two twin-towers ,Harbour Tower East and Harbour Tower West, are currently listed as the tallest skyscrapers in Bahrain. The complex also includes a 12 floor Harbour House and a 7 floor Financial Mall. The majority of the large-scale commercial development project is being constructed on reclaimed land. 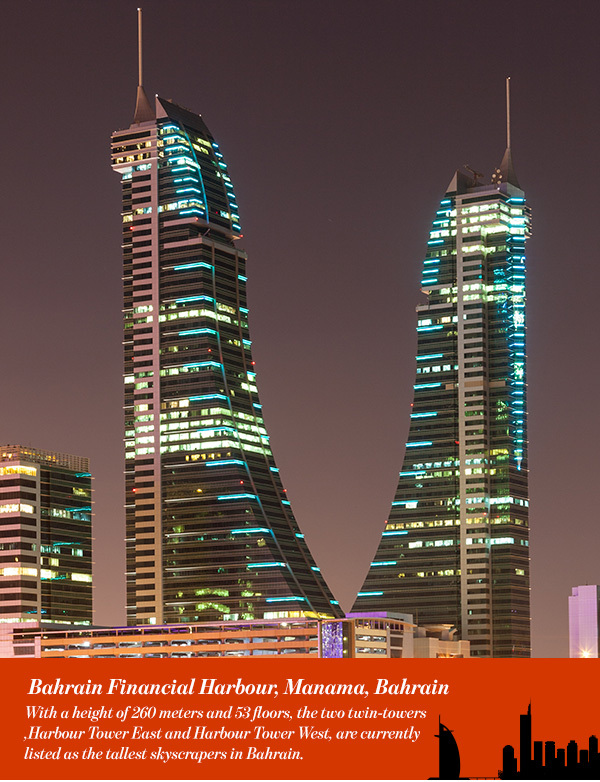 When complete, the Bahrain Financial Harbour will provide a highly technological banking and finance center. Integrated with a modern retail and leisure center.